From the recent Mahler for Vision concert at Carnegie Hall. Original photo by Chris Lee. It was the day before the concert, and cellist Peter Lockman was nervous. He had some sort of mysterious ear issue – not exactly what you want to deal with right before your Carnegie Hall debut. Not only that, but when I met up with him at a café in Harlem, I learned that the first rehearsal for the evening’s program – Gustav Mahler’s Symphony No. 2 – would happen that night. A first rehearsal the day before the concert? I told Peter that I was a little flabbergasted by this. “Big” might seem like an oversimplification, but it wasn’t inaccurate. The whole thing – the music, the orchestra, the mission – was a big deal. Lockman, a 21-year-old cellist and senior at DePauw University, had been invited to play in the orchestra for “Mahler for Vision,” a fundraising presentation of the composer’s “Resurrection Symphony” put on by humanitarian nonprofit Music for Life International, or MFLI for short. He was joining musicians from 120 different orchestras around the world, including groups like the New York Philharmonic and the Chicago Symphony Orchestra. It was also a big deal, personally, for Lockman, who’d been playing the cello since the age of four. Despite his early start, Lockman was quick to insist that it wasn’t natural talent that had paid off, but rather consistent practice and a love for the instrument. “I wasn’t very good when I started,” Lockman said. “You were also four,” I replied. I remember sitting in this uncomfortably warm, annoyingly noisy coffee shop and actually getting chills when he told me this. Lockman may have had doubts about his place in the orchestra, but to me, he fit right in. His attitude towards music as a force for good seemed perfect for an organization like Music for Life International. When I spoke to MFLI’s founder, George Mathew, I found that he and Lockman had very similar views about music. Mathew founded MFLI in 2007 to organize the efforts of a growing group of people who were using music to effect social change. Although they gained nonprofit status in 2008, their humanitarian concerts started earlier. I asked Mathew to explain MFLI’s goals and how they determine which causes to highlight. “If you look at our big concerts, they fall into roughly four categories: natural disasters, conflict and refugees, public health and human rights.” In addition to raising money for relief of global issues, MFLI also focuses on education and teaching leadership. Another crucial component to the mission is thinking of society in increasingly global terms. Since Mathew is a Singaporean-born Indian conductor who studied Western classical music in North America, and has performed in places all over the world, I asked how his global background influences his relationship to traditionally European music. He was very quick to correct me. As it turns out, ethnic identity and music couldn’t be more relevant than at a concert of Gustav Mahler’s music, even though “Mahler for Vision” was a benefit for Help Me See, an organization dedicated to ending cataract blindness. Susanne Mentzer and Indra Thomas and perform at Mahler for Vision. Photo by Chris Lee. Then the music began, and I started to see the connection between the evening’s cause and Mahler’s “Resurrection” itself. The symphony opens in darkness with points of light throughout, and it ends with the brilliant, triumphant sound of the human voice. I was able to see the parallel to someone who lives their life in darkness but regains their sight later on. But the end, oh, the end – that’s where the light came in. 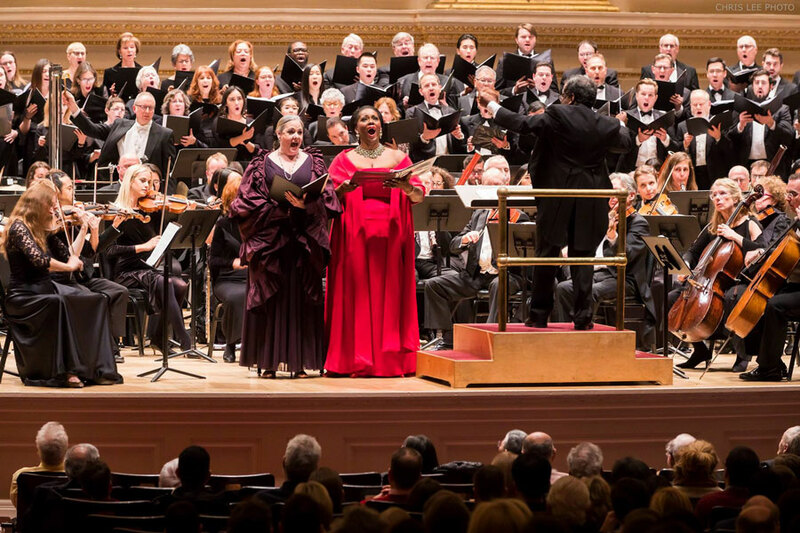 Soprano Indra Thomas and mezzo-soprano Susanne Mentzer sang with a mix of hope, joy and sadness, their voices soaring over the rest of the orchestra. Even though I don’t speak any German, the music itself was so moving that the symphony ended with tears and mascara streaming down my face. Music for Life International showed me that the power of music can manifest itself in tangible ways, even while being emotionally moving. Mathew’s organization joined together incredible musicians from all over the world, it gave a young cellist the chance to play in Carnegie Hall and it raised money for global health. It also made me wonder: What would happen if we all used our musical gifts to help other people?